A drive through Goa’s charming village of Saligao is what will take you to this designer duo’s studio, simply called Botl. From vases, to planters, glasses, ashtrays, more quirky stuff and other cute items are what you will find here. If you have always admired the beautiful lamps in Genuine Broaster Chicken, then now you know where they came from. Made using old glass bottles, we just can’t resist their stuff. 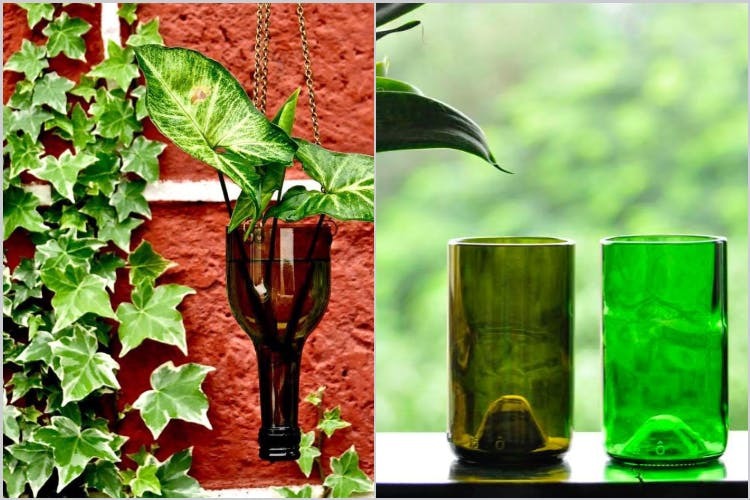 Anyone who loves bottles, loves to recycle them, or just loves colourful glassware to hang their plants in, drink from, use as ashtrays, or as decor will love this store. What's So Unique About It? We simply couldn’t resist their pretty electric lamps that just changed the tone of the space once we lit them up. We also loved that they can personalize their designs for you. Which means, take your recycled or favourite bottles to them and they will create something for you that you will love. Put your partner’s name, family name or even your client’s logo on them and you will definitely be giving someone a unique, environmentally-friendly gift. If you are in Goa then you should definitely head to meet Mikhail & Rhea at their studio to get that personalized gift. And maybe even see how they work to create these beautiful pieces of art that are also functional. You can even find their collections at popular stores like And So, Paperboat Collective, People Tree in Goa or even on the online store Propshop24.